Pearson Altizer received his Bachelor of Music Degree from UT Austin in 2014, studying with Kristin Wolfe Jensen. In February 2015, he played contrabassoon on subscription concerts with the Philadelphia Orchestra, performing La Mer by Debussy, Violin Concerto by Berg, and Atmospheres by Legeti under maestro Robin Ticciati, concurrently with his work at the Curtis Institute of Music as an Artist Diploma student. During his time in Austin, he was Principal Bassoonist with the Abilene Philharmonic Orchestra and a frequent substitute bassoonist with the Austin Lyric Opera and the Austin Symphony Orchestra. Dr. Douglas Bakenhus is the music director and conductor of the Natchitoches-Northwestern Symphony at Northwestern State University in Louisiana where he also teaches bassoon, music theory, aural skills, and conducting. His music degrees are from the University of Texas at Austin (DMA 2006, B.Music Ed.1983), Texas A&M University-Commerce (M.M. conducting 1985) and he has completed additional graduate courses in conducting at the University of Michigan. In addition, Dr. Bakenhus has been the music director of the Northeast Texas Symphony since 2002, and he served as the music director of the Austin Philharmonic from 2001-2004. Other teaching positions include Texas Lutheran University, the University of Mississippi, and public school teaching experiences at Crockett High School in Austin and at Langham Creek High School in Houston. Throughout his teaching career, Dr. Bakenhus has remained active as a guest conductor, clinician, and bassoonist. He recently conducted the San Pedro Sula Chamber Orchestra in Honduras and has toured Canada, Slovakia, and the Czech Republic with the NSU Faculty Woodwind Trio. He recently recorded a CD of flute, bassoon, and piano trios with his wife flautist, Dennette McDermott and Russian pianist, Katerina Zaitseva. This CD was released in May of 2009 by Classical Records (www.classicalrecords.ru) Other recent ensemble performances include on the baroque bassoon with the Tafelmusik Baroque Summer Institute in Toronto, Canada, and with baroque ensembles in Houston, Ars Lyrica, The Houston Bach Society, and Mercury Baroque. Recent modern bassoon performances include: the Shreveport Symphony, the Longview Symphony, the Austin Symphony, and the San Antonio Symphony. Dr. Bakenhus is frequently called upon to adjudicate and clinic orchestra festivals, band festivals and solo/ensemble festivals throughout the United States and abroad. 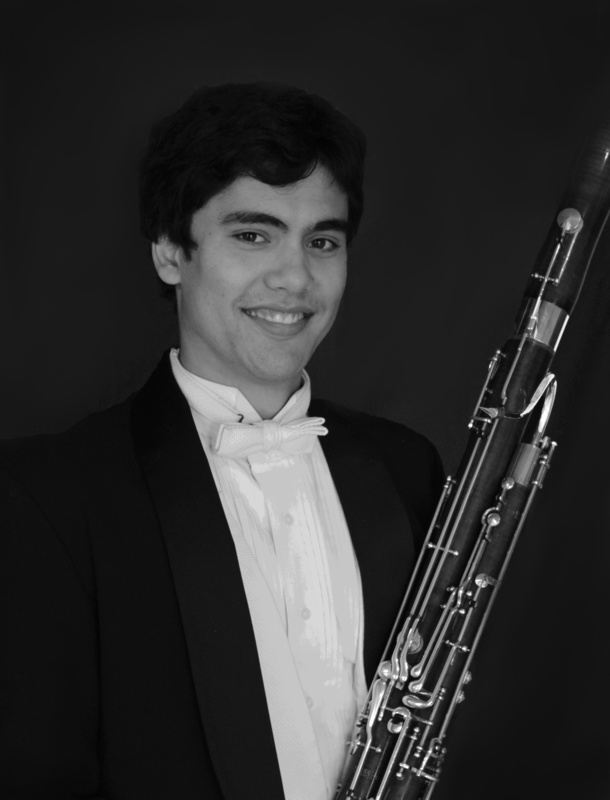 Jonathan Castillo is the principal bassoonist for the Mid-Texas symphony, and is an active freelance musician in Texas and Louisiana. He has appeared with the Shreveport (LA), Victoria, Corpus Christi, Waco, Austin, and San Antonio symphonies, as well as the Hot Springs Music Festival. 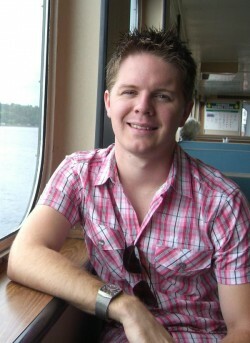 In addition to performing, Jonathan is passionate about education and teaches in north Austin area. When he is not playing bassoon, he coaches indoor cycling classes and is a certified personal trainer. Jonathan holds degrees from Baylor University (BM, 2014) where he studied with Dr. Ann Shoemaker, and The University of Texas (MM, 2017) where he studied with Kristin Wolfe Jensen and served as the teaching assistant for one year. Elizabeth “Beth Ann” Clare, is Adjunct Assistant Professor of Bassoon at Gettysburg College and an active freelance performer in Washington D.C. She received her Bachelor of Music in Performance form UT in 2004, and competed a Master of Music degree at the Cincinnati Conservatory of Music. 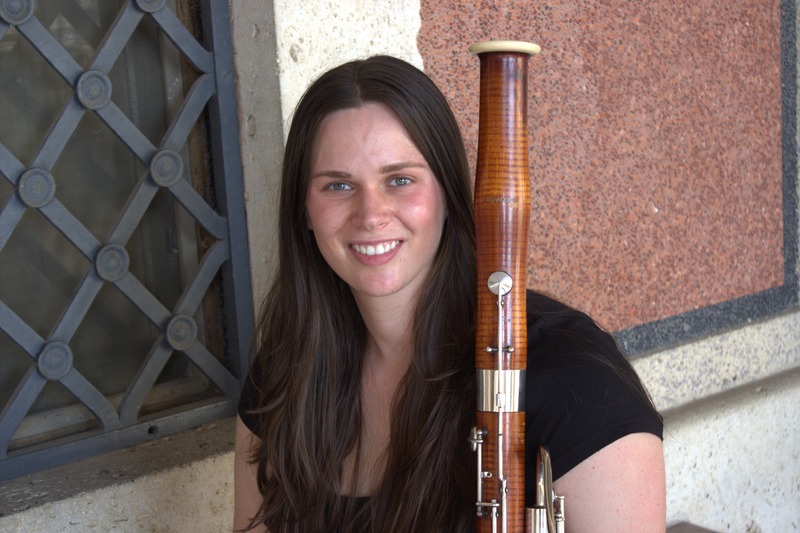 Katie Clark is a bassoonist in the U.S. Naval Forces Europe-Africa / U.S. 6th Fleet Band and a member of the touring quintet. Katie holds a bachelors of music from The University of Texas at Austin, 2013, where she studied under Kristin Wolfe Jensen. She has attended multiple summer festivals and has made finalist and semi-finalist in several auditions and international competitions such as Meg Quigley. She has a growing Skype studio of bassoon students and is a candidate for an instructor position at the Naval School of Music. She aspires to be the first female in her family to attain a masters degree and is excited to see where her career takes her during and after her term with the Navy. 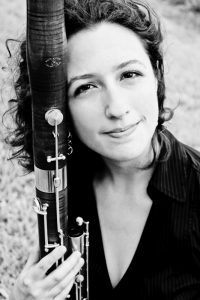 Rian Craypo joined the Houston Symphony as Principal Bassoonist in late 2007, one year after completing her masters degree at Rice University with former Houston Symphony principal Benjamin Kamins. In 2004 she graduated from the University of Texas at Austin, where she studied with Kristin Wolfe Jensen. 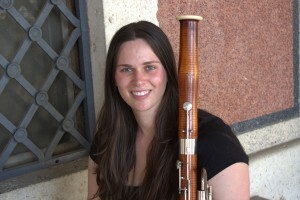 During her undergraduate studies, Rian and her husband Sean (also a bassoonist) were very active in commissioning, performing and promoting new works for bassoon in various chamber settings. In 2003, she premiered Sean’s first concerto for bassoon the plane and the lathe, for bassoon and small ensemble, in Bates Recital Hall. As a founding member of the Blacklight Bassoon Ensemble, Rian has appeared on public radio, in collaborative concerts with the Tosca String Quartet and the Golden Hornet Project, and on the self-titled CD blacklight, which was released in 2005 on the Craypo’s own label, Diabolical Genius Records. Rian can also be heard on the CD Bells for Stokowski with the UT Wind Ensemble, which was placed on the NY Times Top (20) Classical Albums of 2004 list. 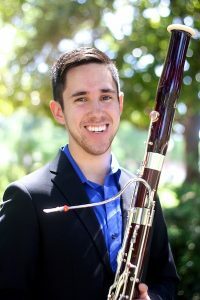 Rian has been awarded several top prizes in competiton, including first prize in the UT Concerto Competition, second prize in the Rice University Concerto Competition (wind division) and in 2004 and 2006, honorable mention in the Gillet-Fox International Bassoon Competition in Melbourne, Australia and Muncie, Indiana respectively. She has also attended the Festival Institute at Round-Top and the Tanglewood Music Institute summer festivals. During her junior year at UT Austin, Rian was awarded a full scholarship to study abroad at the Hochschule fuer Musik in Wuerzburg, Germany under the instruction of Albrecht Holder, former principal bassoonist of the Stuttgart Philharmonic and Ulrich Hermann, member of the Staatsoper Stuttgart. Rian and Sean (now a firefighter) have a daughter and a son. Thomas DeWitt is the Associate Principal Bassoonist and Contrabassoonist with the Kansas City Symphony, a thriving full time orchestra under Music Director Michael Stern. Prior to his appointment in Kansas City, he served several years as Second Bassoonist with the Houston Grand Opera Orchestra. He earned his Bachelors of Music degree at the University of Texas at Austin, studying with Kristin Wolfe Jensen . 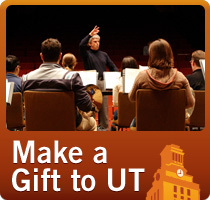 At UT, he won the Winds Concerto Competition, and performed the Mozart Bassoon Concerto, K.191 with the UT Symphony. He continued his studies at Rice University, earning a Master of Music studying with Benjamin Kamins. During his time in Houston, Mr. DeWitt was a regular substitute with the Houston Symphony and Houston Ballet. He has participated in the Tanglewood, National Repertory Orchestra, Round Top, and Eastern music festivals, as well as playing Principal Bassoon with the UT Wind Ensemble during their 2008 European Tour. He enjoys snowboarding and scuba diving, as well as spending time with his family in his hometown, Austin, TX. 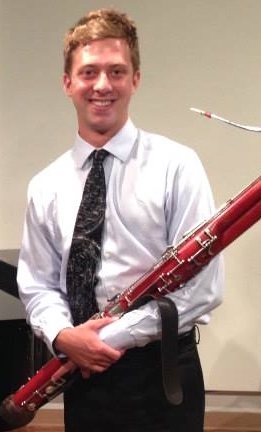 Bassoonist Adam Drake is an active musician across the central Texas region. Based in Austin, Adam teaches a large studio of middle and high school bassoon students, and most recently, was awarded the positions of Second Bassoon with the Lubbock Symphony Orchestra and Second Bassoon with the Symphony of South Texas. Along with his teaching and orchestral pursuits, Adam is also a dynamic chamber musician. As bassoonist and executive director for prismatx ensemble, he enjoys creating multi-sensory concerts and art experiences. A promoter of classical music of all kinds, he collaborates with the Austin Center for Music Therapy’s “Movement Tracks Project,” and is also a board member for the community-based Austin Civic Orchestra. His past summer experiences include the Banff Centre for Arts and Creativity, the National Music Festival, Taneycomo Festival Orchestra, Brevard Music Center’s Institute and Festival, and the American Wind Symphony Orchestra’s 55th season. A native Floridian, Adam was awarded a Master of Music degree from The University of Texas Butler School of Music in May 2017. His primary teachers and other musical inspirations include Kristin Wolfe Jensen, Jeff Keesecker, and Amanda Swain. Daris Word Hale teaches bassoon at Texas State University, is second Bassoonist with the Austin Symphony Orchestra and the Austin Opera, and is a founding member of Wild Basin Winds. One bassoon, 11 orchestras, 7 countries, 47 world premieres, TV, film, commercials, DVD’s, CD’s; life long learner with one heart, one soul, one loving husband, two sweet kids, hundreds of brilliant students, or rather teachers; 7 billion friends; always manifesting music and art. Daris is a Fulbright Ambassador, having served in Tanzania on a Fulbright Grant 2010-11. 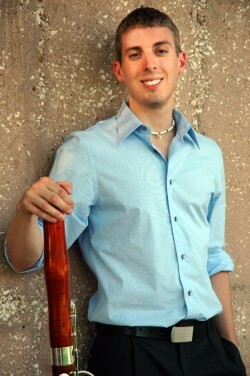 Dr. Kelly Hancock, UT DMA 2010, is the instructor of bassoon at Oklahoma State University. Prior to this appointment, she was a member of the United States Army Europe Band and Chorus, stationed in Heidelberg, Germany. In this engagement she performed extensively throughout Europe as a member of the band, as a featured soloist, and as a member of the woodwind quintet. 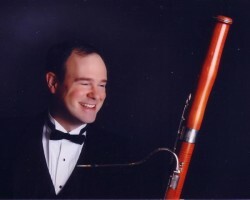 Dr. Hancock has also performed with the Cleveland Opera, Cleveland Pops, Miami Symphony, South Florida Symphony, Ashland Symphony, Canton Symphony Orchestra, and was second bassoonist of the Youngstown Symphony Orchestra. She has also performed with summer festivals including the National Repertory Orchestra and Opera in the Ozarks. 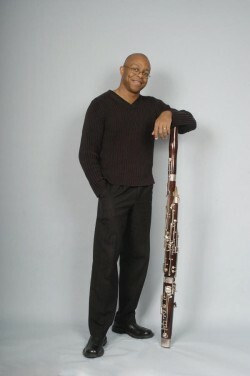 An active and passionate chamber musician, Dr. Hancock was a founding member and bassoonist of the Heidelberg Arts Ensemble, a professional chamber group featuring artistic programming consisting of varied instrumentation. Comprised of musicians from the United States and Germany, this ensemble served the broader purpose of fostering a sense of community between the diverse cultures living in the state of Baden-Württemberg. Dr. Hancock’s commitment to music education has been a constant throughout her career. During her time in Europe, she was actively involved in outreach programs as a member of the Army, and also served as a double reed coach for the World Youth Wind Orchestra Project in Schladming, Austria. She has taught master classes involving students from across Europe, the United Kingdom, Asia, and Australia where she coached students in solo, chamber, and large ensemble musical environments. Dr. Hancock holds a Doctor of Musical Arts degree from the University of Texas at Austin, a Master of Music degree from the Cleveland Institute of Music, and a Bachelor of Music degree from Baldwin-Wallace University. Her principal teachers include Kristen Wolfe Jensen, Barrick Stees, Jonathan Sherwin, and Mark Popkin. Nicole Haywood (UT BM 2014), was appointed Assistant Principal and Second Bassoon with the renowned Grant Park Music Festival Orchestra AND Acting Second Bassoon with the Kansas City Symphony Orchestra in 2018. 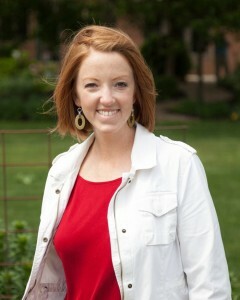 A native of San Antonio, Texas, Nicole has studied with Mark Rogers and Sharon Kuster. She received her Bachelor of Music in Bassoon Performance at The University of Texas at Austin under the tutelage of Kristin Wolfe Jensen and Master of Music degree with Benjamin Kamins at Rice University. Nicole is the Second Bassoonist of Round Rock Symphony in Round Rock, Texas and the Acting Second Bassoonist of Mid-Texas Symphony in Seguin, Texas. 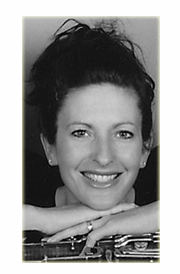 She has also performed with Austin Opera, Chorus Austin, The Victoria Symphony, and The Abilene Philharmonic. She was a semifinalist in the 2014 Meg Quigley Vivaldi Competition and has had great success in regional orchestra auditions Nicole’s summer music festival appearances include the Round Top Festival, Texas Music Festival, Brevard Music Center, and Le Domaine Forget. She has also performed in master classes under Richard Beene, John Clouser, Christopher Millard, and Gustavo Núñez, and taught many bassoon students in San Antonio and Houston. 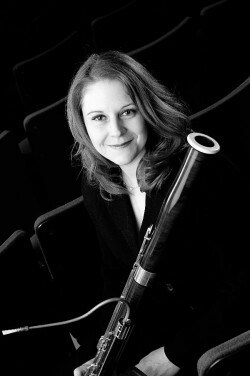 Rebekah Heller (UT MM 2004) is the Executive Director and bassoonist of the renowned International Contemporary Ensemble (ICE) and has played at some of the world’s most prestigious music festivals, including the Mostly Mozart Festival, the Lincoln Center Festival, the Darmstadt International Summer Courses. In the summer of 2013, she released her first solo album, 100 Names, featuring 6 cutting edge, new pieces with never before heard extended techniques for bassoon. Before moving to New York, Rebekah completed a one-year appointment as Principal Bassoonist of the Jacksonville Symphony and has served as Principal Bassoonist with the Atlanta Opera Orchestra, and the Utah Festival Opera. She has also worked with the Spoleto Festival Orchestra, The National Repertory Orchestra and the Conductor’s Institute at Bard College. 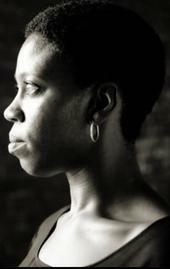 From 2005-2008, Rebekah was a member of the New World Symphony in Miami Beach, Florida. During her time there, she worked with some of today’s most innovative and electrifying musical minds, including Michael Tilson Thomas, Robert Spano, Marin Alsop, Oliver Knussen, Yo-Yo Ma and Christian Tetzlaff. Equally comfortable playing established classical works and the newest of new music, Rebekah is a fiercely passionate advocate for the bassoon. Called an “impressive solo bassoonist” by The New Yorker, she is tirelessly committed to collaborating with composers to expand the modern repertoire for the instrument. Rebekah received her Master of Music degree from the University of Texas at Austin where she studied with Kristin Wolfe Jensen. She attended the Oberlin College and Conservatory of Music for her undergraduate studies, where she earned degrees in both Music, studying bassoon with George Sakakeeny, and English Literature. or New Music, and The Helsinki Musica Nova Festival. She has worked closely with world-renowned composers and conductors such as John Adams, Matthias Pintscher, Dai Fujikura, Ludovic Morlot, Kaija Saariaho and many more. Besides being a passionate performer, Rebekah is also a dedicated teacher, and has served on the faculties of the University of North Florida, Florida International University, and the Vermont Youth Orchestra’s Reveille camp. 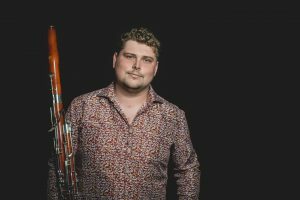 Dr. Nathan J. Koch is the Assistant Professor of Bassoon at Sam Houston State University, and is serving a one-year position as Second Bassoonist of the Houston Grand Opera Orchestra for the 2017-18 season. Dr. Koch has performed with the Austin Symphony and Austin Lyric Opera, the Tulsa, Victoria, and Brazos Valley Symphonies, and the Wichita Grand Opera Orchestra. He has appeared as a featured soloist at the 2008 Kansas Bandmasters Association convention and as a contrabassoon clinician for the online subscription service I Compete in Texas. Festival appearances include the Round Top Music Festival, the Texas Music Festival, the Pierre Monteux School Orchestra, and the Festival de Música de Santa Catarina in Jaraguá do Sul, Brazil. He maintains an active private studio of bassoonists ranging in age from 12 to their mid 60’s. He has served on the faculties of the Austin Chamber Music Center, the Longhorn Music Camp, the Bocal Majority Bassoon Camp, and the High Plains Band and Orchestra Camp. Several of Dr. Koch’s solo and chamber music arrangements are available through TrevCo Music, including works by Vivaldi, Beethoven, and Debussy. Dr. Koch holds degrees from Wichita State University (B.M.) and The University of Texas at Austin (M.M., D.M.A.) where he studied with Nicolasa Kuster and Kristin Wolfe Jensen. Miles Maner joined the Chicago Symphony Orchestra as Bassoonist and Contrabassoonist in the summer of 2013 after playing three years with the Kansas City Symphony as Associate Principal Bassoonist and Contrabassoonist, and several summers as Principal Bassoonist of the Breckenridge Festival Orchestra. He completed his bachelor’s degree with Kristin Wolfe Jensen at the University of Texas in 2007 and his master’s degree with Benjamin Kamins at Rice University in 2009. A winner of Rice University’s Shepherd School Concerto Competition, Mr. Maner performed the Weber Bassoon Concerto with the Shepherd School Chamber Orchestra in 2008. Mr. Maner has attended various summer music festivals, including the Pacific Music Festival, the Tanglewood Music Center, the National Repertory Orchestra, and the International Festival-Institute at Round Top. Dr. Jenny Mann serves as Associate Professor of Bassoon at The University of Alabama and Artist/Teacher at the Hot Springs Music Festival. She holds a Doctor of Musical Arts and Master of Music from the University of Texas. Dr. Mann began her doctoral study at the Eastman School of Music and she also holds a Bachelor of Music Education from Baylor University. Dr. Mann is Principal Bassoonist with the Tuscaloosa Symphony and is an active performer in both surrounding orchestras and chamber ensembles. She is also a member of the Cavell Reed Trio and Capstone Woodwind Quintet both of which actively commission new works for the genre as well as participate regularly in educational outreach experiences for young minds. Her interests have extended into Cuba where she has been an active teacher and performer and is working with her colleagues to increase interest in all modern chamber music genres with the Capstone Woodwind Quintet through public collaborative concerts with the Havana Woodwind Quintet. In addition to her teaching, Dr. Mann coordinates the thriving Chamber Music Program at The University of Alabama that includes educational outreach elementary schools. 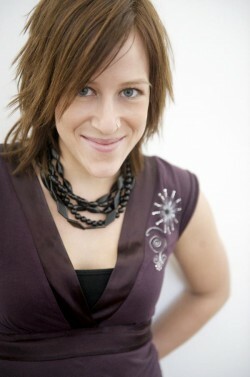 She is also Executive Editor of the magazine, Alabama Music Notes. Dr. Mann is also active with the Meg Quigley Vivaldi Competition and Symposium for bassoonists. She studied with Kristin Wolfe Jensen, John Hunt, David Van Hoesen, Jennifer Speck, Kent Moore and Janis McKay. Dr. Mann continues to be an active clinician and teacher for young musicians. 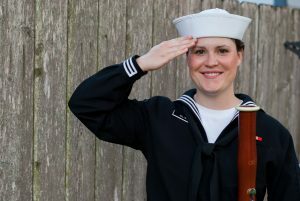 Laura McIntyre is the newly appointed bassoonist of the U.S. Air Force Band of the West. As a soloist, she performed Johann Hummel’s Bassoon Concerto with the Mid-Texas Symphony as winner of their 2015 concerto competition. Laura also received second prize at the 2013 T. Gordon Parks Collegiate Concerto Competition and received accolades at the Tucson Symphony Young Artist Competition and the Texas MTNA competition. Laura is a member of the wind quintet QuinTexas, winners of the Silver Medal at the 2016 Fischoff National Chamber Music Competition and first prize in winds at the 2015 Coleman Chamber Ensemble Competition. QuinTexas has also received honors from the Plowman Chamber Music Competition, the Plovdiv International Chamber Music Competition, and the American Prize. With her husband Hudson Lanier, Laura is a member of Duo Brucoco, a bassoon-guitar duo dedicated to community engagement and education. Laura received a University of Texas Continuing Fellowship–a competitive award granted by The University of Texas’ College of Fine Arts–to pursue extensive research on beginning bassoon instruction. 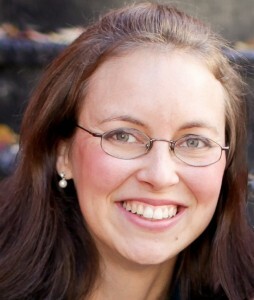 Her research is available to educators and students on her website, www.bassoonsolos.com, and has been published in The Double Reed journal. Laura has presented recitals and clinics at International Double Reed Society Conferences and the Texas Bandmasters Association Conference. As an orchestral musician, Laura frequently performs with the Victoria Symphony, Mid-Texas Symphony, Brazos Valley Symphony, and Round Rock Symphony. She completed her Doctor of Musical Arts from UT-Austin in 2016, studying with Kristin Wolfe Jensen. Her other major teachers include Albie Micklich and Barrick Stees. Eric Stone Miller (DMA 2008) is principal bassoonist of the Brazos Valley Symphony Orchestra and the Austin Chamber Ensemble. He teaches bassoon, chamber music, reed making, music history, music theory and humanities at a number of Central Texas institutions including: Southwestern University, Temple College, Concordia University and served a year-long appointment at Texas State University. He can be heard on the soundtrack for the movie Artois the Goat which was released internationally. He has appeared as a soloist with the Austin Civic Orchestra playing Mozart’s Sinfonia Concertante in Eb, K. 297b.holds the distinction of being the first doctoral student accepted by KWJ at UT, his pursuit of many different musical avenues meant that he wasn’t the first to graduate with said degree : – ). He also holds degrees from the Eastman School of Music and Yale University. A new father, Dr. Miller is in the process of balancing an entirely new (and rather wonderful) set of personal and professional demands. He lives in Temple, TX. Noted for her luscious, rich-tone and compelling musicality, Laura Miller (UT BM 2009, MM 2012) has performed around the world as a soloist, and chamber and orchestral musician. She soloed with the Thailand Philharmonic Orchestra after winning first prize at the 2011 Asian Double Reed Association Competition. Featured at the 2012 Victoria Bach Festival in Texas, she collaborated with Grammy-award winning Soprano and fellow “Emerging Artist,” Estelí Gomez. Laura was a finalist in the International Gillet-Fox Bassoon Competition that same year and the Meg-Quigley Vivaldi Competition two years prior. She was the only American bassoonist to qualify for the 2nd Antonov International Competition for Woodwind Performers in 2014—which was to be held in Kiev but cancelled due to political unrest. From 2012-15 she toured throughout North America with the woodwind quintet, the City of Tomorrow, appearing in venues ranging from university concert halls and churches, to art galleries, bars and rock venues, and several radio broadcasts and a talk show. Back in 2008, Laura embarked on a European tour with the University of Texas Wind Ensemble, performing throughout Switzerland, Austria, Luxembourg, England, and Spain. Laura can be heard on Naxos Blu-Ray Audio, Mark Masters Records, Ravello, and Codaex labels with University of Texas ensembles, the woodwind quintet the City of Tomorrow, and Canadian chamber orchestra Gruppo Montebello. Laura currently resides in South Tyrol, Italy, with her husband and three bassoons (modern, classical, and baroque). During her historical bassoon studies abroad, she attended festivals in Italy, Germany, and the Netherlands to learn from such highly esteemed bassoonists as Javier Zafra of the Freiburg Baroque Orchestra; Christian Beuse of the Academy of Ancient Music Berlin; and Wouter Verschuren of the Amsterdam Baroque Orchestra. In 2017 she received a full scholarship to attend the American Bach Soloists Academy in San Francisco, California. She has concertized on classical and baroque bassoon in Europe with Concerto München, Accademia di Monaco, Concerto de Bassus, and Ensemble Cordia, and recorded on the Savary classical bassoon replica several times, including two opera productions by Simon Mayr for the Naxos label. 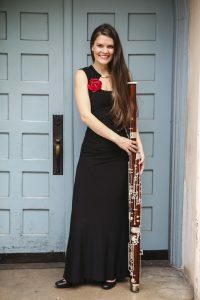 Before moving to Europe in 2015 to complete her second Masters degree in Germany, studying historical bassoons with Katrin Lazar and Lyndon Watts at the Hochschule für Musik und Theater München, Laura performed as principal bassoonist in several Texas symphony orchestras, including the San Antonio Symphony, Mid-Texas Symphony, and Corpus Christi Symphony. Touring throughout North America with the award-winning woodwind quintet, the City of Tomorrow, she presented concerts and master classes while also maintaining an active bassoon studio comprised of around 20 young bassoonists in Texas. In 2011 Laura helped found an early music ensemble in central Texas, known now as the Austin Baroque Orchestra, which continues to perform solely on historical instrument replicas. She served as the UT Bassoon Studio’s Teaching Assistant 2011-2012. 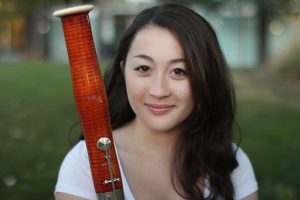 Midori Samson is an educator, advocate for the arts, and the newly appointed 2nd bassoonist of the Arkansas Symphony. In the fall, she will join the Civic Orchestra of Chicago as a regular member and community engagement fellow. In addition to performing around Texas with the Austin, Mid-Texas, and Lubbock symphonies, she has performed with the New World Symphony, Charleston Symphony, New York String Orchestra, National Orchestral Institute, and Pacific Music Festival. Equally committed to teaching and outreach, she has facilitated arts education initiatives with children in Austin, New York, Kenya, and Tanzania, and has volunteered with organizations like Artists Striving to End Poverty in Guatemala, India, The Philippines, and New Orleans, and is constantly searching for ways to connect people through making music together. Originally from Portland, Oregon, she received her Bachelor of Music degree from The Juilliard School, studying with Frank Morelli, and her Master of Music degree from UT in 2016, studying with Kristin Wolfe Jensen. Michael is excited to be returning to his hometown as Third Bassoonist and Contrabassoonist of the San Francisco Opera Orchestra in 2014! 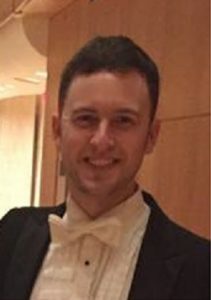 He received his Bachelor of Music degree in 2012 studying with Kristin Wolfe Jensen at the Butler School of Music at the University of Texas at Austin, and his Master of Music degree at he Shepherd School of Music at Rice University where he won the 2014 concerto competition while studying with Benjamin Kamins. 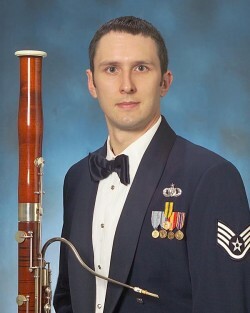 Since May of 2003, Christopher Stahl has held the position of principal bassoon with the United States Air Force Band of Liberty. Born in Coram, New York in 1979, he began playing bassoon at the age of eight. In 1997, he started his formal musical training at George Mason University and graduated in 2001 with a Bachelor’s of Music with Concentration in Education. In 2003, Christopher graduated with a Master’s degree in Performance from the University of Texas. In 2007, Christopher had the honor of performing at the International Double Reed Society Convention at Ithaca College as a member of the woodwind quintet, the New England Winds. During his time in school and as a professional, he has performed with the National Symphony Orchestra (substitute 2000), the Moscow State Radio Symphony (substitute 2000), the Brazos Valley Symphony Orchestra (principal 2003-04), and the Waco Symphony Orchestra (contrabassoon 2004). Christopher has given performances with ensembles at prestigious venues across the United States some of which include Carnegie Hall, in New York City, the Kennedy Center in Washington D.C., the Barnes at Wolf Trap in Northern Virginia, the Chautauqua Institute in NY, and Jordan Hall in Boston. His principal teachers include: Truman Harris, Kristin Wolfe Jensen, and Richard Svoboda. Since 2003, he has been featured on several CD recordings including The Spirit of Ellis Island and his latest woodwind quintet feature album, Discoveries, which includes a commission by Anthony Plog and three world premiers. Christopher’s touring schedule and free downloads of his latest recordings are available at www.bandofliberty.af.mil and facebook.com/usafbandofliberty. Dr. Maya Stone has served as the Assistant Professor of Bassoon at the Middle Tennessee State University (MTSU) School of Music, Visiting Professor of Bassoon at Bowling Green State University in Ohio, and visiting Professor of Bassoon at the University of Missouri. Currently, she is Second Bassoonist with the Huntsville Symphony in Alabama, is running a thriving studio of bassoonists in the Nashville area, and serves on the board of the Meg Quigley Vivaldi Competition and Symposium. Stone has given master classes solo and chamber music recitals around the United States, and has performed in Europe and South America as well. She holds a D.M.A. in bassoon performance from the University of Texas at Austin, a M.M. in bassoon performance and woodwind specialty from Michigan State University, and a B.M. in music education from the SUNY Potsdam Crane School of Music. She studied with Kristin Wolfe Jensen, Barrick Stees, Frank Wangler and Michael Kroth. Amanda Swain (BM 2009) is the Principal Bassoonist of the Houston Grand Opera, and Second Bassoonist in the Houston Ballet and was selected to teach Professor Jensen’s students for a semester as a sabbatical replacement in 2017. She received her BM at the University of Texas at Austin where she studied with Kristin Wolfe Jensen and her MM at Northwestern University where she studied with Christopher Millard. She was the Second Place winner in the 2012 Fernand Gillet-Hugo Fox Bassoon Competition. Amanda was the second bassoonist for the Round Rock Symphony and the Civic Orchestra of Chicago, and has substituted with thw Chicago Symphony Orchestra. She has played under world renowned conductors Leonard Slatkin, Jaap van Sweden, Xian Zhang, Esa Pekka Salonen, and others. She was a founding member of the Chicago-based contemporary ensemble The City of Tomorrow, who won the Gold Medal in the Senior Wind Division of the Fischoff Competition in 2011 . Other accomplishments include winning First Prize in the Meg Quigley Vivaldi Competition (2010), being a semi-finalist in the Heida Hermanns International Woodwind Competition (2007), and being selected as an alternate for the Gillet-Fox International Competition for Bassoon (2010). She grew up in Friendswood, Texas. Shih-Min Tang, born in Taiwan, resides in Austin, Texas where she maintains a large private studio, and performs with the Richardson and Victoria Symphony Orchestras. She is the second prize recipient in the 2017 “Golden Classical Music Award” International Competition and performed on the winners’ concert in Carnegie Hall in 2017. She has also received accolades at the Young Texas Artist Competition and the Asia Double Reed Association Competition. As an orchestral musician, Shih-Min has performed with the Austin Symphony Orchestra, Kingsville Orchestra, Monte Vista Orchestra and Lubbock Symphony Orchestra. She has traveled as principal bassoonist with the New York Gilbert & Sullivan Players for their “Pirates of Penzance” Tour and the University of Texas Wind Ensemble for their 2014 World Tour. She also has traveled with Taipei National University of Art as principal bassoonist for the International Choral Kathaumixw. She has performed in the United States, United Kingdom, Taiwan, Japan, China, Thailand, Canada and Hong Kong. 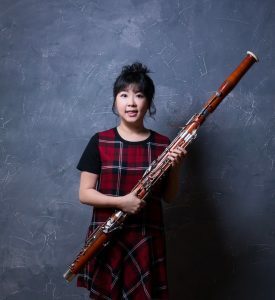 Shih-Min received her Doctor of Musical Arts in Bassoon Performance at The University of Texas at Austin in 2015 where she studied under the tutelage of Professor Kristin Wolfe Jensen and served as the bassoon teaching assistant. She received her MM from Indiana University where she studied with Kathleen McClean. Lecolion Washington, Jr. (BM 1999) was appointed the Executive Director of the Community Music Center of Boston in 2017. Previously, he served as Associate Professor of Bassoon at the Rudi E. Scheidt School of Music at the University of Memphis and bassoonist of the Memphis Woodwind Quintet. He received a Bachelor of Music in Music Studies from the University of Texas at Austin and a Master of Music in Orchestral Performance from the Manhattan School of Music. He also did Artist Certificate studies at Southern Methodist University. His principal teachers were Kristin Wolfe Jensen, Frank Morelli, and Wilfred Roberts. As a chamber musician, Washington has performed with principal players from orchestras all over the world including the New York Philharmonic, the Minnesota Orchestra, the Mozarteum, the Leipzig Gewaundhaus, and the Orpheus Chamber Orchestra. He has performed with the New York Chamber Ensemble and the North Country Chamber Players (NH). In the summers, Washington serves on the faculty of the Stellenbosch International Chamber Music Festival in South Africa where he performs, coaches chamber music, and teaches master classes along with faculty from all over the world. Washington is also the founder and director of the PRIZM Chamber Music Festival, which occurs annually in Memphis. The PRIZM Festival creates intensive chamber music experiences for students and adult amateurs. As a soloist Washington has performed concertos with the Round Top Festival Orchestra, the Eroica Ensemble, and the Meadows Symphony Orchestra at Southern Methodist University among others. Professor Washington has given recitals and master classes at schools around the country including the Eastman School of Music, the University of Missouri-Kansas City Conservatory of Music, and the University of Texas at Austin. He gave a lecture-recital on music for bassoon by African-American composers at the 2007 National Association for the Study and Performance of African American Music Conference, and he has performed at International Double Reed Conferences in 2005 (Austin, TX), 2007 (Ithaca, NY), 2009 (Birmingham, UK), and 2010 (Norman, OK). Washington has attended the Texas Music Festival, the Cape May Music Festival, and the International Festival Institute at Round Top. In 2008 his first CD, Legacy: Works for Bassoon by African-American Composers, was released on the Albany Records label. The recording was met with rave reviews in several publications and websites including All Music Guide, The American Record Guide, and Fanfare Magazine. He has recently recorded the Eric Ewazen Concerto for Bassoon and Wind Ensemble with the University of Memphis Wind Ensemble. He currently serves as principal bassoon of the Eroica Ensemble in Memphis and performs regularly with the Memphis Symphony Orchestra and the IRIS Orchestra. He has served as guest principal bassoon with the Memphis Symphony, the Arkansas Symphony, the Sphinx Symphony Orchestra, and the Reno Philharmonic. 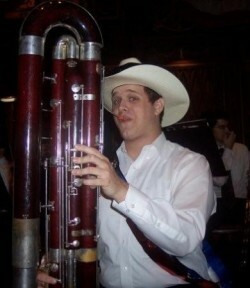 Washington is a Fox artist and plays on a Fox 660 bassoon. 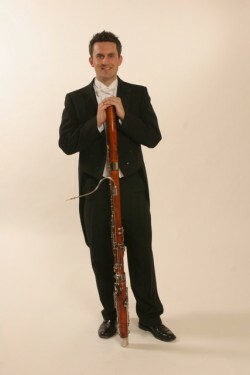 Steven Wilson joined the National Symphony Orchestra as second Bassoonist in 2001 after three seasons as principal bassoonist of the Virginia Symphony. 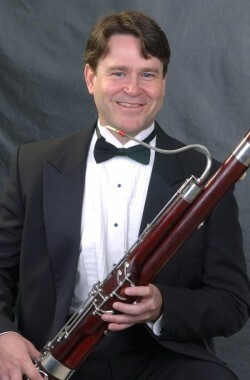 Previously, he served as Second Bassoonist in both the Tulsa Philharmonic and the Abilene Philharmonic. He studied at the University of Texas at Austin with Kristin Wolfe Jensen and at Abilene Christian University with Andy Patterson and Eric Wilson. He has participated in the Round Top, Chautauqua, and Colorado Music Festivals. He currently lives in Alexandria, Virginia with his wife, NSO English Hornist Kathryn Meany, and their twins, Austin and Lucy. 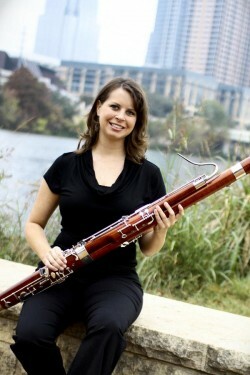 Julia Windle teaches private bassoon lessons in Austin and performs with Round Rock Symphony Orchestra and Waterloo Sound Conspiracy. 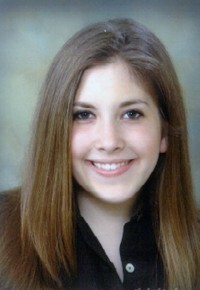 A native of Kingsport, TN, she holds a bachelor’s degree in Music Performance from the University of Texas at Austin. She is a graduate of the Interlochen Arts Academy and has participated in the Colorado College Music Festival, Brevard Music Center, Interlochen Arts Camp, and Las Vegas Music Festival. Julia has performed with Brazos Valley Symphony Orchestra, Temple Symphony Orchestra and, Orquesta Sinfónica de la UANL (Monterrey Symphony Orchestra) in Monterrey, Mexico. Former teachers include Kristin Wolfe Jensen, Barrick Stees, and Keith McClelland.